Who said winter is a boring time in the garden?! 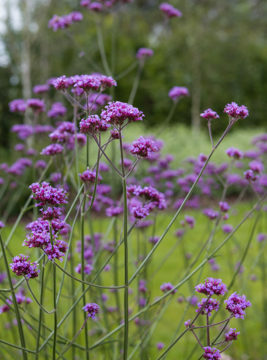 There are lots of great plants which provide visual interest at this time of year, and here is just a small selection. 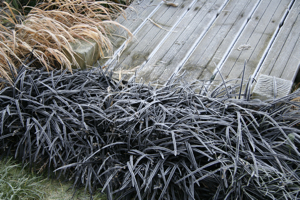 Also known variously as ‘Black Dragon’, ‘Ebony Knight’, or ‘Arabicus’, this lilyturf is an extraordinary looking plant with arching purple-green leaves that turn jet black when grown in full sun and very well-drained soil. It’s a small clump-forming, evergreen perennial growing to 20cm high. Its tiny bell-shaped, purplish-white flowers in summer are followed by round, dark blue-black fruit. As it is so dwarf and such a dark colour, it is easily lost in the middle of a mixed border so it looks best grown against a light background such as gravel, or next to plants with contrasting foliage. In my own garden I use it to edge a path and also next to a timber bridge and a deck where it can be seen in all its glory. In winter a dusting of frost makes this plant look particularly attractive. Ophiopogon prefers good, slightly acid, soil in full sun or partial shade and will spread to form a sizeable colony, needing no maintenance at all other than curbing its growth when required (but as it’s not a vigorous grower that’s generally not a problem). 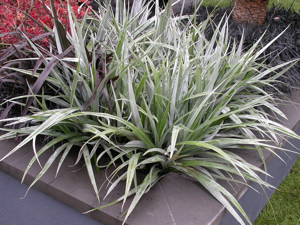 As an alternative to the black variety, try straight Ophiopogon planiscapus which has bright green leaves and tiny white flowers. This is a compact form of ‘Firethorn’ which is semi-evergreen. Deep green glossy leaves will hold through winter unless it is very cold. Spiny branches are easily trained on a wall or fence in sun or shade and moist soil. In late spring and early summer the plants are smothered in large clusters of tiny white flowers. These are loved by bees and are followed by orange berries in autumn – a favourite with Thrushes and Blackbirds through the winter. Ultimately this Pyracantha will reach 2.5m tall with a similar spread. 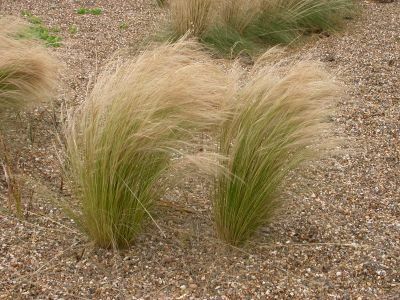 A resilient plant that is tolerant of most conditions, including both drought and pollution, although in frost-prone areas is better sheltered from cold, drying winds. 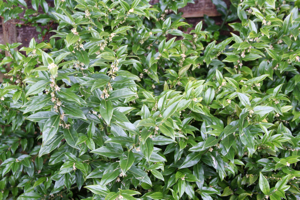 One of those unsung heroes of the garden, Sarcococca confusa (commonly known as ‘Sweet Box’ or ‘Christmas Box’) is an easy, neat, low, reliable evergreen shrub which doesn’t do a great deal until the depths of winter when its small white scented flowers pack a real punch. Good in shade or sun and any reasonable soil, with small glossy evergreen leaves, position it near a door or pathway where you will get the benefit of its beautiful fragrance. Even if you’re not a great fan of yellow flowers, there is no denying that Mahonias will brighten up even the dreariest of winter gardens. Unlike the low growing types, the Mahonia x media varieties are upright evergreen shrubs with a statuesque shape, wonderful spiny architectural foliage and scented flowers. They make a great addition to the shady garden. Mahonia are hardy, do well in most soils and need no pruning if allowed to reach their natural mature height (approx. 3 metres in the case of ‘Lionel Fortescue’). Ferns are such easy and useful plants, bringing lovely textures to shady planting schemes. 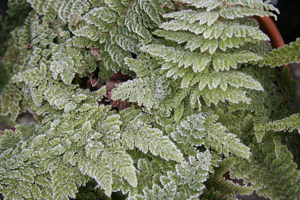 This Polystichum (or Soft Shield Fern) is also evergreen which means it’s very useful for winter interest (shown here in frosty conditions). 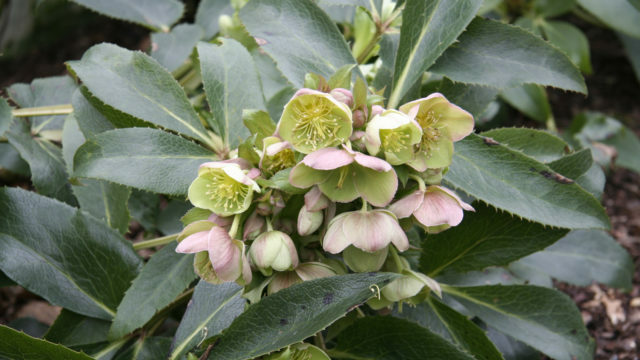 It can be grown in pots in the shade or in borders as underplanting for deciduous shrubs and trees. This is a lovely compact plant (at 60cm high max.) which is happy in most garden soils as long as it doesn’t get too dry. It’s a great companion to plants such as Hosta, Liriope, Luzula nivea, Brunnera macrophylla and Hellebores which enjoy the same growing conditions. 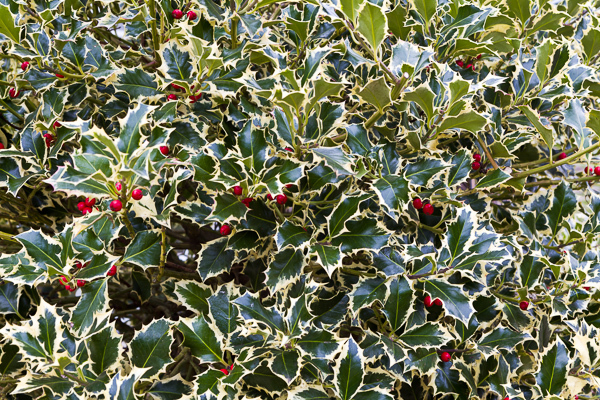 ‘Tis the season to be jolly …’ This holly will perk up shadier corners and it looks especially cheery in winter sunshine. The spiny leaves have a creamy margin and young growth is tinged pink. 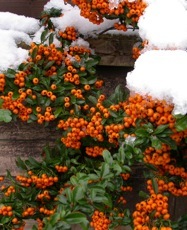 The bright red berries of the female plants are a valuable food source for birds in winter, and of course the stems are brilliant to cut to decorate the house at Christmas. Hollies are slow growing and this variety (known as ‘Arge Marge’ to those of us in the business!) is ideal to keep as a shrub or use as a hedging plant. 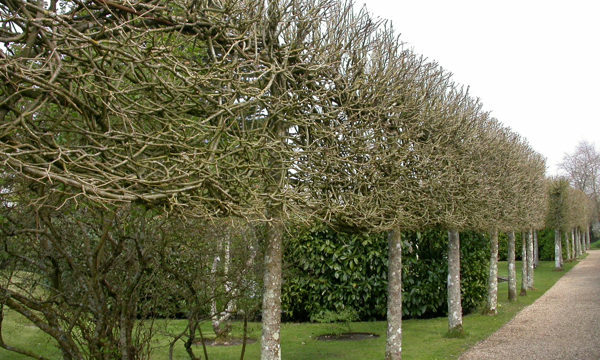 Hollies can also be trained on a single stem to form a mop-headed tree. Easy to grow, tough plants, they are happy in either sun or partial shade, and not too fussy about soil types. Perfect! 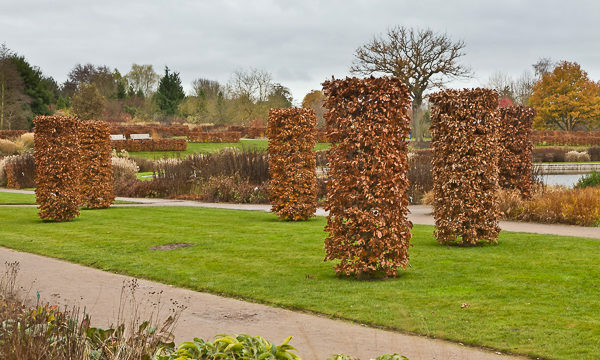 You can also read more about plants with colourful stems to brighten up the winter garden including dogwoods, willow, bamboo and ornamental brambles by clicking here.